Deposit to book place on eBatt-Topspin Summer 2019 Table Tennis Camp including 5 days training from 12th to 16th August 2019 and 5 nights accommodation @ the Harefield Academy, Middx. Full balance of £470.00 is due by 31st July 2019. 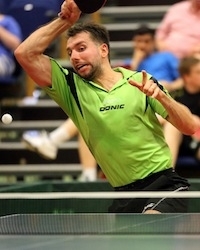 5 day table tennis training camp with 5 nights on site accommodation + eBatt-Topspin Camp Shirt. No evening meal provided on Sunday 11th August. Ages from 10+ welcome but table tennis standard must be a minimum of local league level or above.